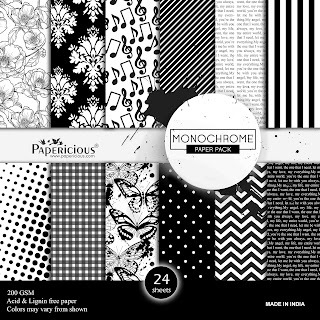 Papericious just launched the new Monochrome paper pack in evergreen Black n White color series. These come in 12x12 inch and 6x6 inch paper packs ideal for all your crafting needs. Here is quick inspirational post in line with upcoming festive season. I have used the monochrome pack to make an explosion box . Another new launch are the 3d chipboards. These chipboards are 3d in nature and can be locked via locking mechanism. They can be used for stand alone projects. For my explosion box I have used the Christmas tree and the Stars.